Brewery visits can mean a lot of things. There are large industrial breweries where you get a standard tour to watch bottles and crates flash past at incredible speed. 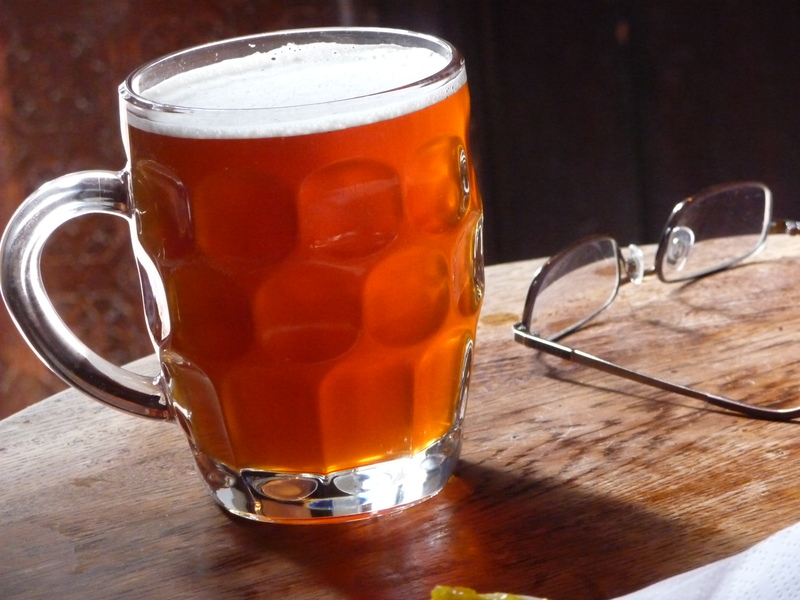 There are old breweries which may have a museum or a cozy brewery tap with their most interesting brews. There are micros in wastelands of concrete and parking lots where there ain’t much of an interest. And there are micros that blend into the local community, cooperating with other small-scale producers and traders. 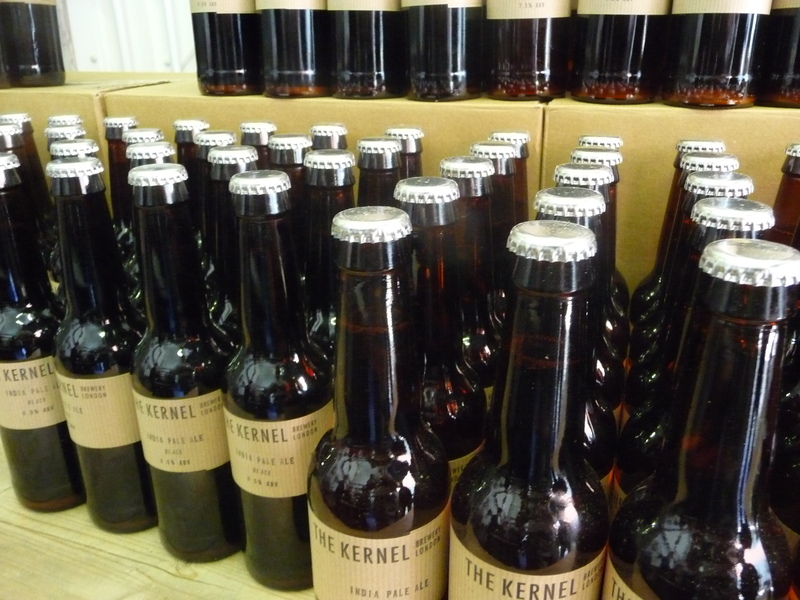 The Kernel Brewery in South London is one of the new micros established over the last year or two, and they seem to be present in bars and shops all over London at the moment. 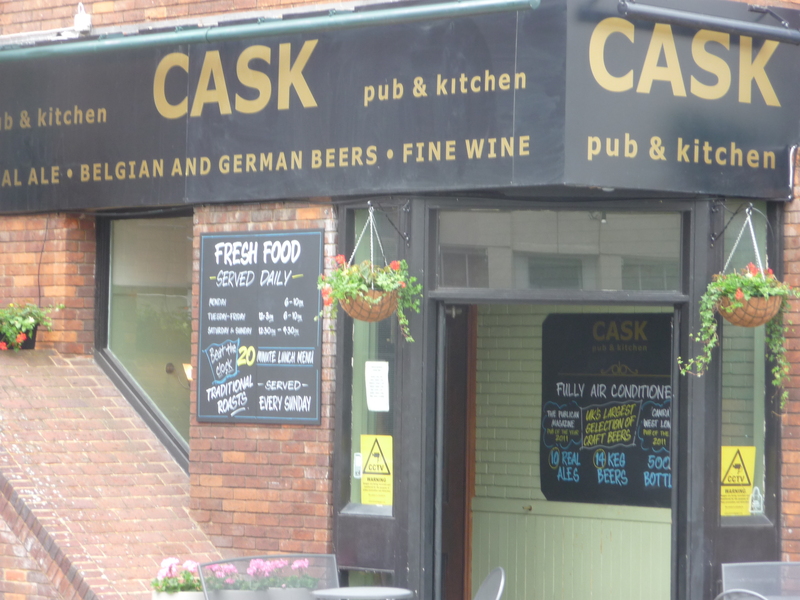 They brew an ever-changing range of beers, and if you want to try as many as possible, there is one place to go. The brewery is open for business on Saturdays. You can buy their bottled beers to take home, but you may also try kegged or bottled beers on the spot. There are a few tables and benches, there are a few deli counters with cheese, hams and sausages. Open every Saturday 9-3. The location? Half a mile or so east of London Bridge Station/Borough Market. The address is 98 Druid Street, but the entrance is at the back, though the railway arches. Very close to Tower Bridge. A quiet and civilized oasis, particularly compared to the frenzy of Borough Market. The beers? Pale ales, IPAs, porters and stouts. Quite a few single hop beers. I tried the Centennial Chinook Pale Ale on tap. Hazy gold, lots of malty body, a hop showcase without getting too extreme. Bittersweet with black pepper and mint. If I didn’t have other things scheduled, I’d be happy to stay until closing time. I am probably a bit of a snob, but I am usually avoid food at airports and railway stations. But sometimes you cannot do any advance shopping, meaning you have to pick up something before running to your gate or platform. You’d usually go for an over-priced baguette in from one of the chains – you know exactly what you get. It is nice to find really good stuff once in a while. Linate airport in Milan has lovely grilled panini. Both Tegel and Scönefeldt in Berlin have fine Marché restaurants to eat in or take away, offering healthy seasonal produce at reasonable prices. 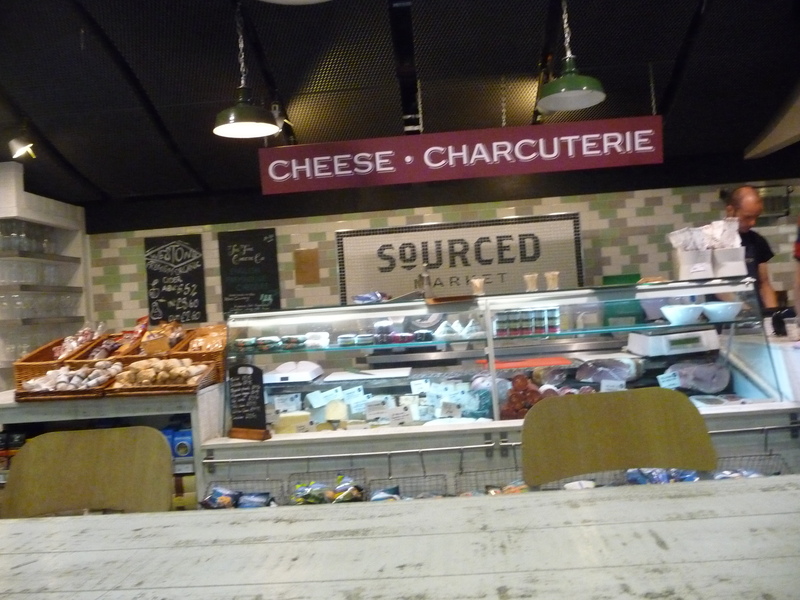 And Sourced Market in St. Pancras station, London, has fine fare for travellers. Meat and cheese sliced fresh, fruit and vegs, coffee and baked goods. Snacks like pork pies and Scotch eggs. Hot meals, too. 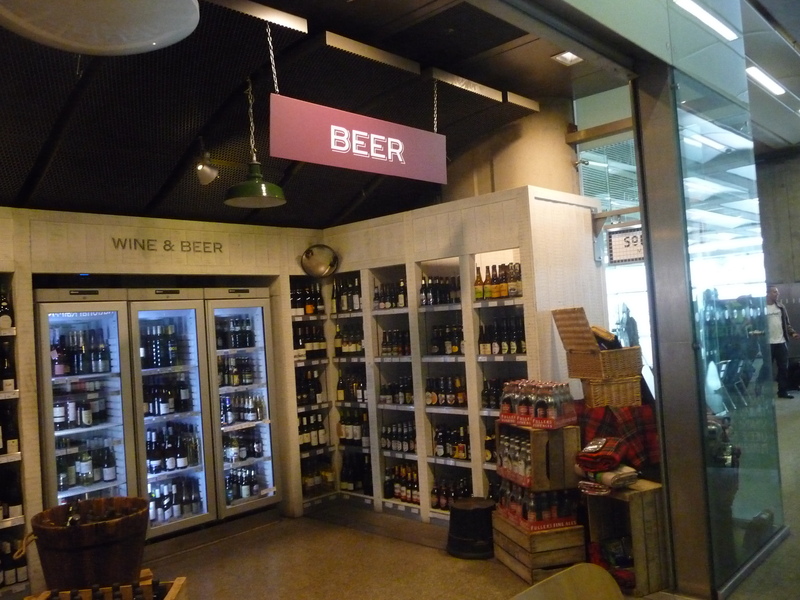 And there is a very decent beer department, offering chilled drinks for your journey. Local beers from Kernel and Fuller’s, imports from Germany and Belgium. Not a staggering range, but enough for anyone to pick something nice for their journey. And there are even tables where you may sit down and enjoy our food and drink if you have time before your train departs. I’m sure you can save a few pennies if you buy sandwiches from M&S instead. But I hope there are enough customers to make the quality alternative viable. This is, for all purposes, a new pub, even if there has probably been an old boozer on the premises. The front is not up to much, no old-fashioned pub sign outside. It is in Pimlico, but for most of you it is more informative that it is less than ten minutes’ walk from Victoria Station, extremely handy if you land at Gatwick. 10 cask hand pumps. A dozen keg beers. Hundreds of bottles, a blackboard outside boasts of 500, and I don’t dispute that. Mikkeller on Keg. A dozen Nøgne Ø bottles. Lots of American stuff I’ve never seen anywhere in Europe. 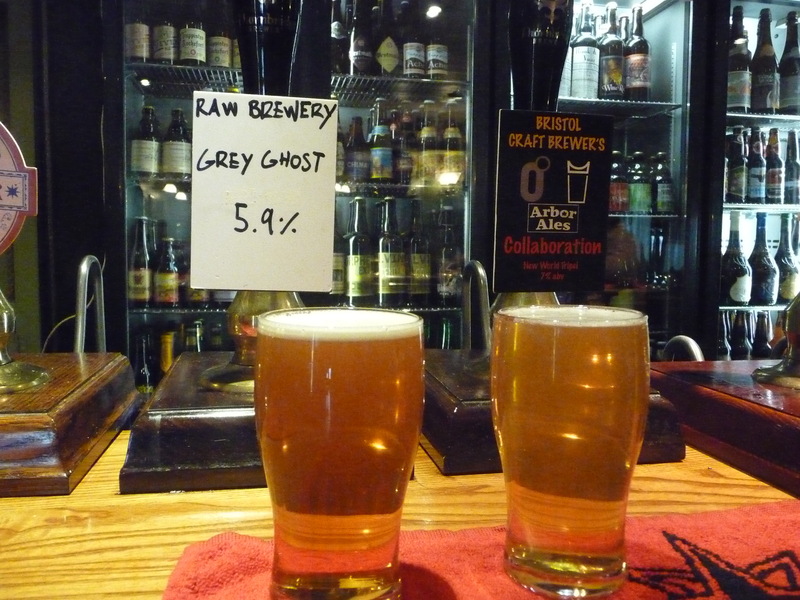 And the cask ales are hand-picked from the best and most interesting micros. Otley O-mai. Dark Star APA. Bristol Beer Factory. Triple Rock. Hard Knott. A mixed bunch of drinkers on an early afternoon, this is a residential area right on the edge of lots of office and retail streets. A must stop in London, and it is soon to be joined by a sister establishment in Clerkenwell. And if you are on your way from Victoria Station sto somewhere else, you can buy both bottles and draft beer to take away. Bright and airy interior with large windows to let the light in. Funny how people send a fortune shipping ready made fake English pubs to Scandinavia filled with bric-a-brac and photoes of Queen Victoria and Winston Churchill while the new British pubs tend to look rather Scandinavian! I was invited to London for a wedding reception last weekend, and of course I used the opportunity to get an update on the beer scene, as I haven’t been there for more than a year. 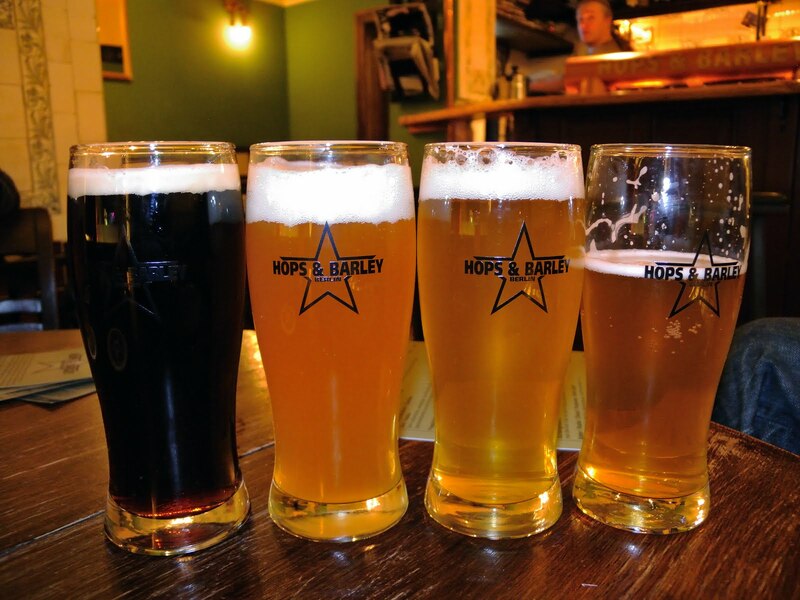 The beer revolution has really come to town with new micro breweries and new pubs with outstanding beer lists. I only managed to scratch the surface of the London beer scene this time, but there will be some posts over the next week or so showing what I managed to cover. A German beer museum is being established in Central Berlin, due to open next year. It is the first independent beer museum in Germany, though there are smaller museums dedicated to particular breweries or regions. The web site is still under construction. Thanks to Lieblingsbier.de, where you also can find details as a post for a volunteer to help build the museum over the next 12 months. Perhaps we may hope for something a bit more multilingual than the Brewery Museum in Brussels? No international beer festivals for me this year, but there are interesting things happening here in Norway, too. I won’t go into a full report from the Øl & Mat festival here in Oslo a few weeks ago. I felt it was badly organised, they had a weird system of 2 cl samples which lead to long lines – and most of the announced new beers were absent. But there are more promising things ahead. There have for several years been obstacles to my attendance at the Trøndersk Matfestival in Trondheim, which takes place during the last weekend of July. Is seems like I’ll be able to make it this year. 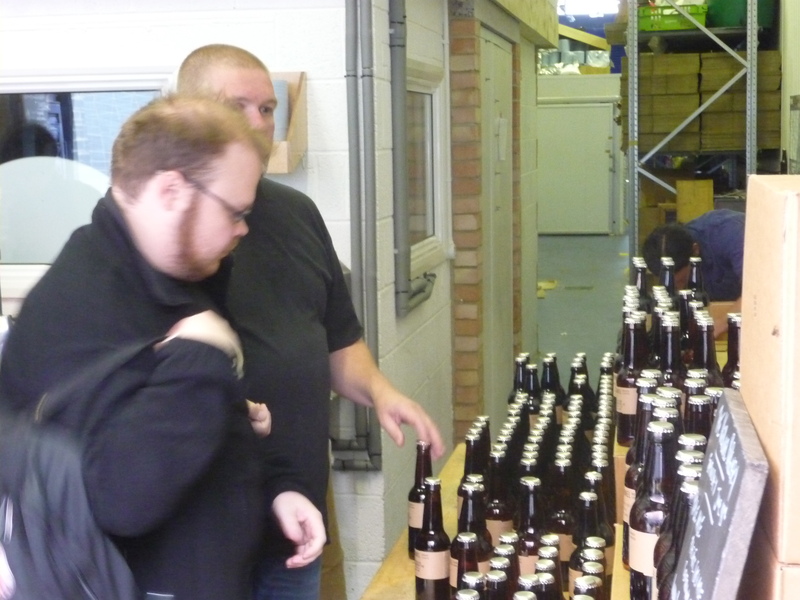 The regional micro breweries have usually been around to present their stuff, some of which is very rare stuff. 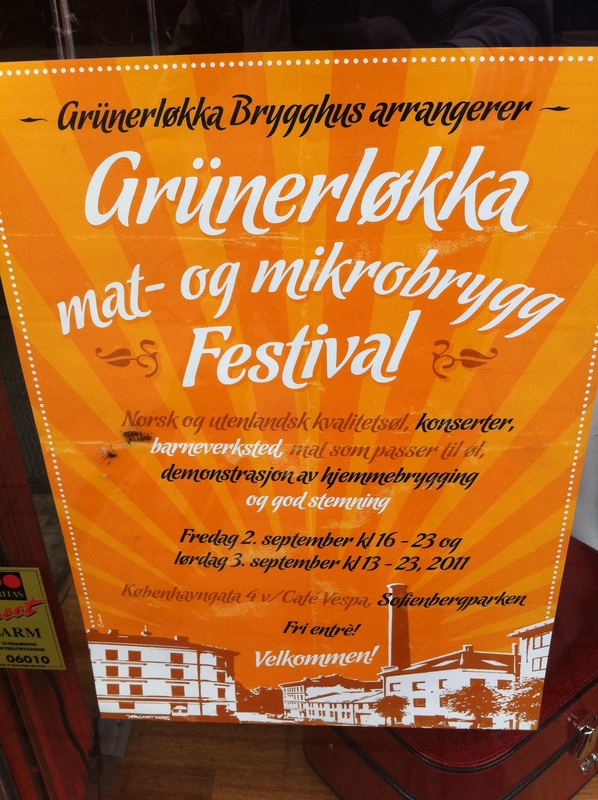 Then there is a repeat of the Grünerløkka mat- og mikrobryggfestival (meaning food and microbrew) in early September. this is a small laid-back affair where the micro breweries present their stuff, there is good food at moderate prices and a jolly atmosphere. Finally, the restaurants at posh Aker Brygge and Tjuvholmen at the Oslo waterfront will have a beer festival in October. No details as yet.